Horses who are ridden properly (not on the forehand) will greatly reduce the potential for long-term damage – with a soft hand, a soft seat, a soft mouth, and a soft back – yet absolutely uphill, straight, and through the poll without any pulling or kicking. Of particular note is the fact that he has a beautifully rounded croup, the angle of the hind leg is such that it is almost under the girth, and the horse’s eyes and ears are alert and forward. The rider is in absolutely classical dressage position with shoulder-hip-heel alignment and the horse looks like he is responsively moving ‘uphill’. He takes less than 10 strides to make it down the side of the dressage ring in an extended canter that looks similar to the beginning of a levade. Pictures like this give me hope that there are still riders who understand the concept of correct riding. This is in direct contrast to an article written many years ago titled Trakehners and Totilas Revolutionize Sport Horse Breeding. The article is an alarming example of the misinformation that is being presented today to excuse the lack of correct training in the “modern” dressage horse, and some of the specific observations require direct countering. The horse’s general anatomy and means of locomotion has not changed in thousands of years but the lack of education as to what actually improves and protects a horse is on the rise. What we are seeing being rewarded at the dressage shows is one of the main reasons for this descent into harming instead of helping our horses. The rules written by the FEI which follow the classical principles of dressage training and movement are being ignored and replaced by flashy movement, particularly the “show trot” that thrills the uneducated audience who are unaware of the harm being inflicted upon the horses. The writer of the article himself recognizes that modern dressage “for historical reasons” is a deviation from classical training two hundred years ago. The horse is no longer a necessary source of food, transportation, and fighting wars – their sole survival depends on our egos and in wanting them around for sport and companionship. As their roles have changed, form is now overshadowing function. Saddlebred (Saddle Seat) demonstrating over-exaggerated leg movement with a hollow back and legs out behind. Source Wikipedia. The pictures of the horses included in the article speak for themselves. This hollow, flashy “style” of locomotion is nothing new. The over-exaggeration of leg movement is being performed and rewarded in the Saddlebred and Gaited Horse industries. Disconnecting the horse and hollowing its back are exactly what they strive to do as this is the only way a horse can get the front legs moving on a different plane than the hind legs. The acceptance of this “style” is an absolute contradiction of the original foundation of dressage. What will we see next? Firecrackers and chains around the pasterns? The author is correct that modern warmblood breeding programmes are exemplary. The breeding industry is producing amazing athletes with incredible natural movement. Understandably these youngsters will exhibit this “style” of exaggerated movement. They are excited, untrained, and are not carrying the weight of a rider. It is our responsibility as trainers to develop a horse’s ability to carry a rider. The ability to connect through the back and engage the hindquarters is a fundamental requirement for any horse in any discipline. This connection is what preserves, protects, and allows the horse to become a light, harmonious partner. Left to its own natural state, a horse will travel on its forehand, with its center of gravity naturally forward and behind the elbow, and drop its back away from the weight of a rider (or the pain of a poorly fitted saddle). In order to carry the weight of a rider and saddle, and preserve the musculoskeletal and tendon-ligament health of its body, the horse must travel in a correctly engaged frame. The “show-trot” may look fancy, but how many of these horses continue to perform with any longevity without sustaining injuries or without requiring invasive treatments to maintain their performance? The push to rapidly breed horses is causing over-population problems and ongoing dilemmas with slaughter and euthanasia. To satisfy market demand, horses are pushed harder and at increasingly younger ages with significant physical (and often emotional) harm that they simply cannot sustain. The judges perpetuate the physical damage and unethical training methods by rewarding the end-results consistently in the arena. Horses are the innocent ones in the human pursuit of ribbons, monetary gain, and personal egos. They have not chosen for us to ride them. We owe it to them to confront and refute this fad of non-training that is receiving high marks by judges that haven’t read, or who choose to ignore (for whatever reason) the rules. 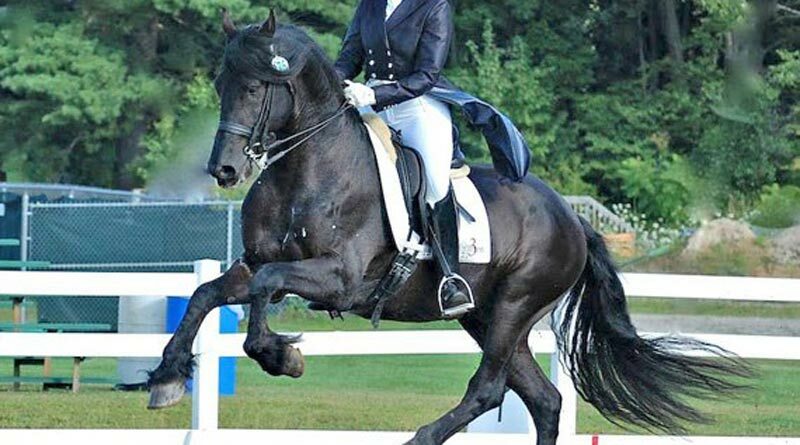 If we are going to accept this deviation away from classical dressage then let’s not insult the rest of us who believe in the classical principles and who would never accept or give a good score to this new “modern” movement. Call it what you want but please don’t call it Dressage. The paradox is that it actually means less work for me as a saddle fitter and ergonomist if the horses are actually ridden badly – with a hollow back, without moving the hind legs, and just moving in the front. These horses that are ridden like this will stay straight in the back will never change their musculature positively or significantly. It’s easier and cheaper to maintain saddle fit, just sad that horses will suffer in the long run. Very good article thank you – my mentor Einar Schmit-Jensen was one of the authors of the FEI Principles and a friend and pupil of DeCarpentry – both are spinning in their grave – modern dressage in no way resembles their ambition and certainly Einar would be appalled at what passes for dressage today.